But a new generation celebrating the history of women entrepreneurs and forgotten African-American chefs has rediscovered Smith’s rare Treasure Chest of Fine Foods cookbook set and the story of a businesswoman who came from East Texas timber country owning only a cook’s white uniform, but went on to bake for presidents and champions. I have never worked for a race, always for people. … I see much deeper than skin. When she joined a national “gift lift” effort to send soldiers fruitcakes and other local foods as memories of home, Smith was 73 and her biscuits were sold in supermarkets and served in the Johnson White House and on American Airlines. “It was a natural project for her, because she had made all these connections with powerful people in Fort Worth and Texas and used her connections to promote and uplift the community,” said historian and archivist Carol Roark of Fort Worth. Roark helped rekindle interest in Smith through the 2007 collection Grace & Gumption, Stories of Fort Worth Women and a later cookbook. In 1965, the Star-Telegram published photos and asked readers to donate postage for the fruitcakes baked by Smith and friend Fannie Houston. The “gift lift” also unified civic efforts to support all soldiers a year after the Civil Rights Act, with local race relations unsteady and school desegregation incomplete. Lucille Smith’s Chili Biscuits are still served at her great-grandson’s Houston restaurant, Lucille’s. The next year, Mayor Willard Barr declared “Lucille B. Smith Day” and hosted a dinner at Sycamore Recreation Center. It was her greatest recognition for a Fort Worth career that began in 1912, when the native of Kennard and graduate of what is now Huston-Tillotson University in Austin moved here with her husband, chef and barbecue pitmaster U.S. Smith. In 1927, Lucille Smith started as a vocational education teacher for $56 a month. U.S. Smith was the traveling barbecue chef for early rodeo promoter Col. W.T. Johnson of San Antonio, and by 1941 Lucille Smith published her first Treasure Chest. By 1949, she was selling her “Lucille Smith’s All Purpose Hot Roll Mix,” considered the first commercially packaged mix for dinner rolls. She made appearances for Caloric gas stoves and developed chili-powder biscuits that became her signature after U.S. Smith died in 1956. 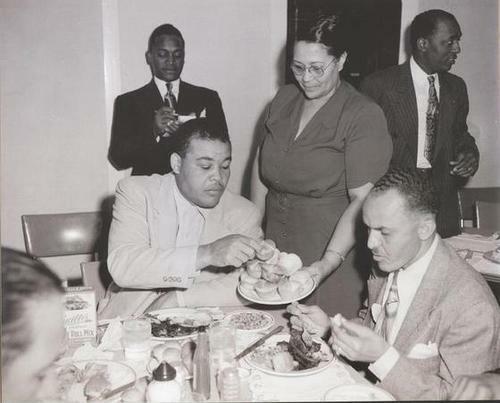 Great-grandson Chris Williams’ Houston restaurant, Lucille’s, has unearthed photos of Smith serving biscuits to 1940s heavyweight boxing champion Joe Louis and shaking hands with Martin Luther King Jr. at his 1959 appearance in Fort Worth. She also cooked for Elliott Roosevelt and his mother, First Lady Eleanor Roosevelt, when Elliott owned a ranch east of Benbrook. “Thanks to the wonderful people who have observed me in my efforts to aid in building a better society in this city, state and nation. “Thank God, my dreams have come true and He and people have overpaid me — a black woman, so honored! She baked that love, spirit and faith into every fruitcake.